How do we bring the endemic island fox back from the brink of extinction? Island foxes evolved on the California Channel Islands, a chain of eight islands located off the coast of southern California. In the late 1990s, the foxes on Santa Cruz Island and its neighbor islands to the west, started to decline rapidly. Research revealed that this was due to predation by golden eagles which had been spotted on the island for a few decades, following the disappearance of bald eagles due to pesticide poisoning. The presence of nesting golden eagles was indicative of a larger problem: an ecosystem out of balance. Feral pigs, originally introduced during the ranching era (the mid-1800s to late 1970s) had become abundant on the island, and were already known for their devastating effects on the native vegetation. Ignored by bald eagles which feed heavily on fish, the pigs were the perfect meal for golden eagles which hunt land animals. As golden eagles began nesting on the islands and their numbers increased, they also began hunting island foxes. At only four pounds, the foxes are the largest native land animals on the islands and play vital roles in the plant and animal communities, such as dispersing seeds of shrubs that are unique to the islands. common on the islands but never found on the mainland. They were likely introduced to the islands by Native Americans thousand years ago and played an important role in those societies, as evidenced by the ritual fox burials discovered throughout the Channel Islands. Island foxes proved to be easy prey because they evolved without predators and don’t have the instinct to hide from eagles. Within a few years on Santa Cruz Island, the fox population dropped from an estimated 2000 individuals to less than 100. Just 15 foxes remained on each of two neighboring islands. The situation needed to be addressed. In 2004, the island fox was added to the endangered species list and Conservancy was engaged in multi-partner and multi-disciplinary efforts to restore the island ecosystem and recover the fox. 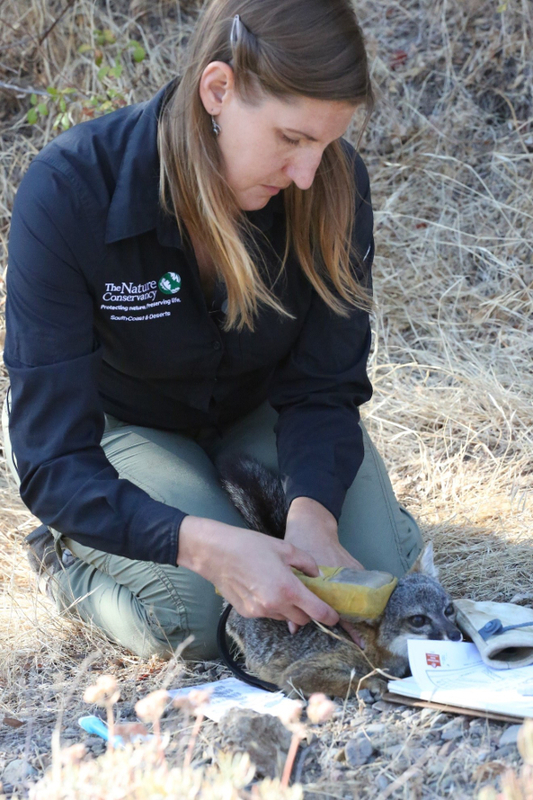 To bring the island fox back from the brink of extinction, the Conservancy and partners launched a multifaceted research, wildlife management, and monitoring program. Once the research identified the causes of the fox’s decline, land managers translocated the golden eagles directly threatening the foxes and removed their primary food source by eradicating the feral pigs. Scientists designed and conducted a complex pig eradication utilizing GPS technology to track the hunter’s movements. Important new scientific methods around measuring eradication success and confirming completion were developed on the islands in these years. At the same time, Conservancy scientists, working closely with statistical experts, designed a dynamic monitoring program. The design allowed the team to adjust the management strategy in response to changes in population estimates or survival rates detected in data from telemetry collars and live trapping. 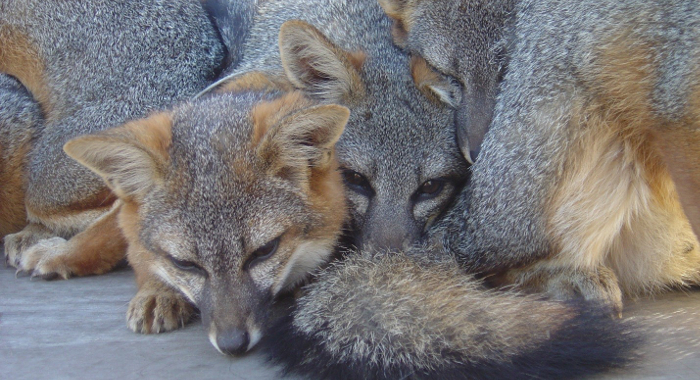 Simultaneously, the Conservancy began a vaccination program to protect the fox from the most dangerous and common diseases that could be accidently brought from the mainland.Also during this time, the Conservancy brought Santa Cruz Island’s foxes into captivity to protect them and to breed them for later release back into the wild once the threats were controlled. Meanwhile, Conservancy scientists worked with university researchers, and state and federal agency scientists to develop clear criteria for determining when the island fox would be biologically recovered and thus could be removed from the endangered species list. These criteria were incorporated into the official Recovery Plan written by the Fish and Wildlife Service for the island fox. Data gathered by the island fox monitoring program on fox survival and abundance was used to model the fox’s probability of extinction over the coming 50 years. When that extinction probability remained below a threshold defined by the criteria the recovery team was able to conclude that the fox population was recovered. Since then, the use of these biologically-based recovery plans for threatened and endangered species have multiplied. For example, criteria based on those developed for the island fox are now being used for the Laysan Albatross and the California Condor. In August of 2016, the island foxes were removed from the endangered species list in the fastest mammal recovery ever accomplished. Following the removal of the pigs and golden eagles, the foxes were released back to the wild on Santa Cruz Island and have since flourished. Our monitoring continued and confirmed that the foxes were on their way to recovery. In 2016, the data indicated that there were an estimated 2000 foxes on the island and in August of 2016 the foxes were removed from the endangered species list in the fastest mammal recovery ever accomplished.